Ughhhh! 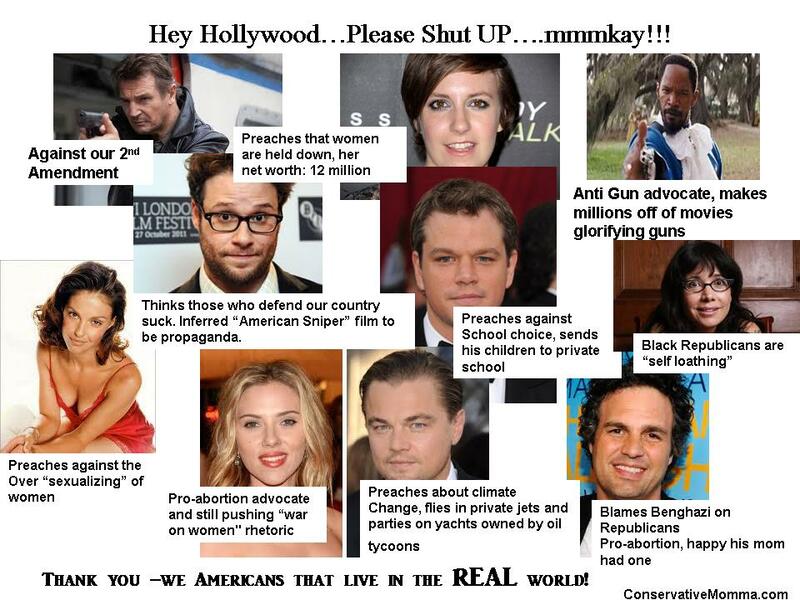 I am seriously so over Hollywood celebrities shooting their mouths off politically! I mean just shut up! After Michael Moore’s comment about sniper’s being cowards and Seth Rogen referring to the box office hit “American Sniper,” as “propaganda,” -I gotta say I am at a place where I get nauseous when a celebrity opens their mouth on any subject manner that requires thought. I lived in Hollywood, I worked for a very well known celebrity, I know the “scene” well and I gotta say….they are all hypocrites. They shoot their mouths off, when they have NO concept of reality! Very few of the celebrities I came in contact with knew how to drive, cook, shop, or even carry on a normal conversation involving eye contact. I often felt like I was in the twilight zone-for real! They are so wealthy that they don’t know what to do, so they try to pretend like they “know” ….when they DON’T KNOW!!! I really think a lot of them struggle with guilt and that’s why they jump on the liberal gravy train. They think everyone who has money, should give it to those that don’t, and they want the government to impose this through taxes. I find it really hypocritical because they personally spend big bucks to hide their money, in off shore accounts, tax loopholes and alternate living addresses. It’s like, I’ll preach and tell you to do something, but I am going to not do what I am preaching for you to do….aka….Hypocrisy. That’s when it comes around to election time-all these celebrities start speaking out for a cause-which is always a liberal cause, because liberals are the only ones who care (sarcasm). Here’s the thing, these people are entertainers, actors, who are experts at playing a “part.” Their job is to convince you! I just saw through it all, and it made me sick….so sick, I left. Before you watch some starlet spout her mouth off about a cause, just remember that she probably doesn’t even know how to make a piece of toast….seriously…. So Hollywood, until you buy your own groceries, cook your own food, fill your tank with gas, raise your kids without a full time nanny, mow your own grass, drive a car……shut the hell up! When did the GOP become so Democrat??? They make a living being someone they’re not, playing make believe. That’s all they will ever be good for.